This FLIR home performance thermal imaging camera combines entry-level features with several key on-screen analysis tools. It also includes several enhanced visualization and communications/reporting features necessary for more demanding applications. It comes with 160X120 infrared resolution and a thermal sensitivity of <0.07C. 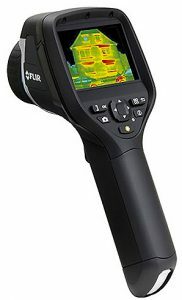 The FLIR E40BX has a ± accuracy of 2%, WiFi connectivity to mobile devices, 3.5-in. touch screen display and much more.Even has voice and text annotation. With this transmitter, combined with the JobLink app, you can start running your HVAC jobs through your mobile device. You can fill out inspection checklists, view live measurements, gather in-depth diagnostics, and adjust systems to live data.Take photos and notes for each system. All reports can be emailed to customers and office, as well as saved in the cloud for access at anytime. 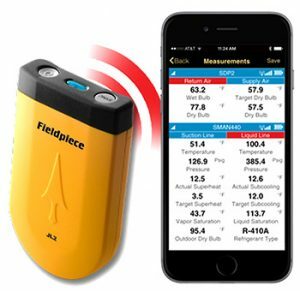 The JL2 Transmitter receives measurements from any Fieldpiece wireless manifold (SMAN4, SMAN440, SMAN460) the Fieldpiece wireless dual in-duct psychrometer (SDP2) and wireless clamp meters (SC460 & SC660) via radio frequency for extra distance – up to 100’ from instrument to phone. Then the JL2 transmitter converts all live measurements and data to a bluetooth connection with your mobile device. It comes with a belt clip, a 3.7 VDC rechargeable battery via a mini-USB port, and a USB charging cable. 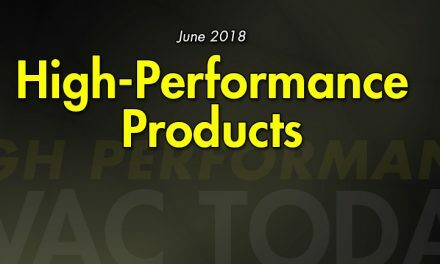 For more information, or to order, go to ncilink.com/JL2, or call 800-633-7058.